DUBAI Investments Park (DIP), the largest integrated commercial, industrial and residential community in the Middle East and wholly-owned subsidiary of Dubai Investments PJSC, has announced that Phase 8 – the final phase of the 2,400 hectare mixed-use development – will be fully completed by the end of the first quarter of 2014. Once complete, the 430,000 sq m Phase 8, being constructed at a cost of Dh325 million ($88.4 million) across two stages, is expected to be a hub for logistics services as a significant portion of land has been allocated for this sector. Phase 8 entails construction of a total of approximately 375 warehouses and light industrial units. The first stage of Phase 8, which was completed in mid-2012, has been fully leased and is approximately 80 per cent occupied. Phase 8 will have a well-planned road network, electricity and water network, sewerage system and irrigation and district cooling facilities on a total built-up area of 2.4 million sq ft. Over the years, DIP has invested in excess of Dh3.5 billion on infrastructure facilities within the park, and today accommodates over 3,450 tenants and sub-tenants representing a wide array of industrial, distribution, logistics entities and residential units. Since it was incorporated in 1997, Dubai Investments Park has achieved many milestones – 1998 saw the completion of its master plan and commencement of Phase 1 infrastructure development. In 1999, it signed the first lease agreement. The construction of Phase 1 was completed in 2000 and was totally leased out in 2002. In 2003, Phase 2 was officially inaugurated. Starting 2004, DIP has witnessed the commencement and completion of infrastructure development of various phases. Keeping in line with the growing demand from companies across industry verticals, DIP has been strategically expanding its extensive range of facilities to include schools, showrooms, hotels, offices, mosques, warehouses, factories, industrial facilities and residential staff accommodation. 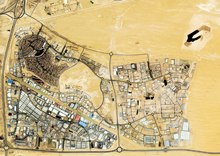 DIP is one of the largest business and residential communities in the Middle East. Strategically located within minutes from the Jebel Ali Port and Al Maktoum International Airport at Dubai World Central, it is a self-sufficient city featuring state-of-the-art facilities and world-class infrastructure.